Brooklyn emcee Kev The Pope has a message for the ones that didn't hold him down on his new single "Where Were You" featuring Jav. "Where Were You" is the lead single off Kevs upcoming album Crazy Weird Cool Love set for release May 25th. Although this record explores themes of deceit and portrayal, Kev remains positive and his overall tone is more triumphant than defeated. 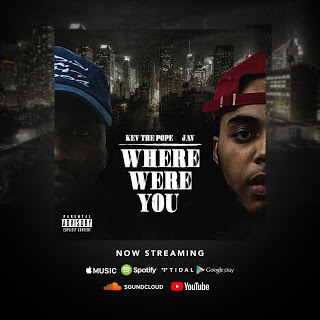 With an instrumental that includes a modernized bop and flows from the two emcees that fit the progressive mold of today's hip-hop, there is no reason why "Where Were You" can't be worked in our current climate of the industry. This record has everything you want from a sonic perspective and when you package it with a quality visual from @vTapeken that is when everything starts to click. From the kitchen to Times Square, this visual really does a good job of bringing the song to life and symbolizing the journey that Kev is exploring on the record. Kev The Pope has a unique journey and an interesting path that can be traced back to his days as a youth. Kev grew up in a musical household and at around 12-years-old he was already experimenting with sounds across all genres from hip-hop and R&B to pop and reggae. Not only was his direct family an influence on his musical path, but Kev was inspired by an unlikely hero, the late-great Sean Price. Sean Price is a hip-hop legend and god emcee who happened to live in the same building as Kev. Kev got a chance to rap for him at the park one day and Price liked what he heard, so he took him under his wing. Now that Sean Price is in a better place, Kev is carrying the torch and using all of the gems that Price gave him to keep the essence alive. Kev The Pope is only getting started and "Where Were You" is a testament to his progress, check out the video below and look out for Crazy Weird Cool Love on May 25th.